Apex Trail is the main trail connecting many of the Apex park trails to one another. You can start on the west (top) end off of Lookout Mountain road or from the east (bottom) off of the Heritage Park parking lot depending on the day. It's a difficult technical climb as you work your way up this one. It's steep enough to get your heart rate up, then it throws water bars and lots of big rock moves at you to shatter your momentum. It's rideable, but many will have a tough time clearing the whole thing in one shot. 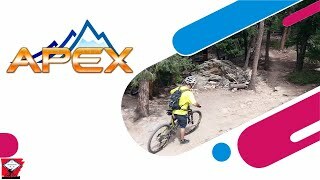 As a descent, Apex is a blast. This trail is rowdy, fast and technical. Expect difficult rock maneuvers, drops and high speeds. One of the most fun descents in the area. The trail was dry with a few small patches of lingering snow in the switchbacks. Very nice bike rack and tools, air pump and restrooms at the lower parking lot. I found the steep uphill and downhill sections to be rutted. A rocky climb up the Apex Trail. Riding in Golden's Apex Park.